If you’re a man who likes a little playfulness in your approach, this may just be your new favorite way to score women. All it takes is a little bit of patience and a little bit of luck. Follow the three phases, and you could be going out with a woman way out of your league by the end of the night. Find a group of women. If you have a wingman ready to take the dive, you can run this game on a pair of women, but a group is better. It means that no one else has a chance with the hottie while you’re spending time with the other woman. Pick out the woman you want to go home with: the hottie. Pick out another woman who isn’t very attractive, but tries hard to be. She’ll be wearing a lot of makeup and a good dress. She’s trying hard. At first glance, she might pass for a hottie herself. This is why you need to spend time selecting who you’re actually trying for. Or get a drink, or whatever activity is appropriate to the situation. Make sure that you ask her right in front of the more attractive woman. This will be a blow to her self-confidence, because even if they’re friends women always know who’s the more attractive between them. Going after a less attractive woman will confuse the woman you actually want. If the less attractive woman agrees, the game is afoot! Buy her the drink or take her to dance, and pick little disagreements with her. This is easy to do. If she says she loves the song, say it’s “only OK.” Buy her a cheap drink. Keep her attention for ten or fifteen minutes, and make sure that you strike out. This can be harder than you thought if the less attractive woman is starved for attention. 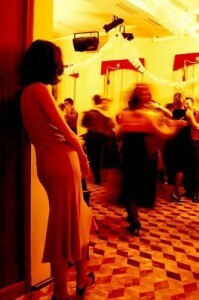 Take as long as you need, and then wish her a good night and go back to the dance floor. Wait a few minutes, and then enter Phase Three. Once you’ve gotten over the less attractive woman, run into the hottie again. Say hello, and isn’t this nice, and would she maybe like a drink? Act a little bit less confident than you did when you asked out her friend. She’ll call you on it, and say you just asked out her friend. That’s when you say your line. You and her friend didn’t click, but you’re not that heartbroken. She seems like a nice girl, but you were really interested in the hot woman all along. You just thought she was out of your league, but now there’s nothing left to lose. The flattery will go right to her head and cover the bruised patch of her ego. She’ll be thrilled by the attention and quickly recover. Once you’re allowed to buy her a drink, the ice has been broken and you can continueto pursue her. Stick to this three phase plan, and you’ll have an in with a gorgeous woman without risking rejection by approaching her outright. You’ll have her on your line and she’ll never know she was played.